With the winter holiday season approaching, you and your team are likely making vacation plans and getting ready to take some much needed time off from work. As fun as the holiday season can be, this is also a very stressful time of year – especially if you depend on Q4 sales to meet your year-end goals. Managing personal holiday commitments with professional obligations can cause any employee to feel stretched thin. This stress can often lead to decreased work performance or, in worst cases, mild levels of depression. Holiday stress can affect all levels of the workforce; know that you’re not alone – your boss and team are likely feeling the strain too. But don’t worry – we’ve compiled some easy tips and tricks you can use to beat the holiday blues. Be Realistic – Know Your Limits Does your to-do list seem overwhelming at first glance? Take a deep breath and know you are not alone. 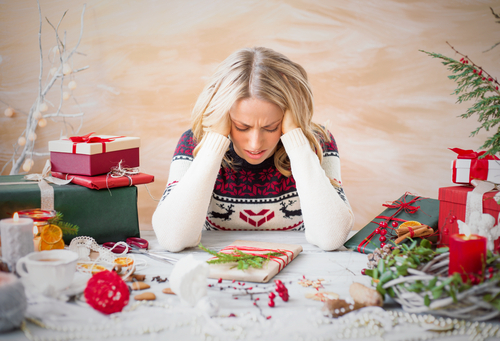 Over commitment to activities is one of the leading stressors of the holiday season. Utilizing tools like Google Calendar or a simple pen and paper to make a to-do list for tasks will allow you to see the ‘bigger picture’ and what is realistic for you and your family. Leverage these tools to plan out your tasks for each day and space them out so they do not fall on one weekend. It is okay to skip a function or two to spend a night indoors and relax! Be sure to also pay close attention to your spending habits. It is easy to get carried away with gifts for your children and decorating your home from top to bottom. This, sadly, can create a financial burden when you get that credit card bill in January – yikes! Make sure to set a hard price limit for each member of your family – sticking to your budget will ease the burden for the following months and allow you to enjoy the season. You’re Only One Person Your to-do list may involve tasks that can be delegated to other family members – take advantage of this opportunity! Enlist your children to help with wrapping presents or addressing envelopes for holiday cards. If your children are computer savvy, have them design the family holiday card and have them printed at a local store or sent via email to cut costs. Furthermore, you can reward family members with an extra allowance for cleaning up the house or just outsource it to a cleaning service for a minimal fee. Make Time For You Do you tend to focus on others that you forget another important person in your life? (Hint: It’s you!) Make sure to take a step back from the holiday chaos and find time to relax. Read a book, take a bubble bath, or go outside for a run. These little mental and physical breaks are quick pick-me-ups that allow time for you to unwind and disconnect from life for a bit. Remember What the Holidays are About The holiday season is more than giving to your friends and family – it is about giving back to others when you have been blessed through the year. Make plans with your social group to volunteer at a soup kitchen, ringing a bell for the Salvation Army, or participating in a local food or toy drive. Or, cut a check and donate to one of thousands of great organizations that meet your values – and enjoy the tax deduction on your taxes. While the holidays can be a difficult and stressful time, remember the big picture: enjoying time with family and spreading goodwill to others. Do not be afraid to reach out for help when you need it, whether it is at home or at the office, so you can enjoy a happy, blessed holiday season. Emplicity understands that HR Outsourcing should be simple and meaningful. As a Professional Employer Organization (PEO), we strive to be a great partner in supporting your business. If you would like to request more information on how we can assist your needs, please reach out to us at 877-476-2339. We are located in California serving the Orange County, Los Angeles, and the greater Sacramento and San Francisco areas.